A couple of hour for ourselves, to chat and catch up and to enjoy good food. We are 5 friends, 5 women, 5 mums. In rotation we invite each other in our houses and bake something yummy to enjoy with a cuppa. In the center of the table there is always an array of colorful fresh vegetable sticks and one or two dips. Predominant is the hummus: classic or with various flavors. It is such a versatile dip that you can give any flavors to it: tomatoes, mint, hot chilly and…curry like in this recipe. 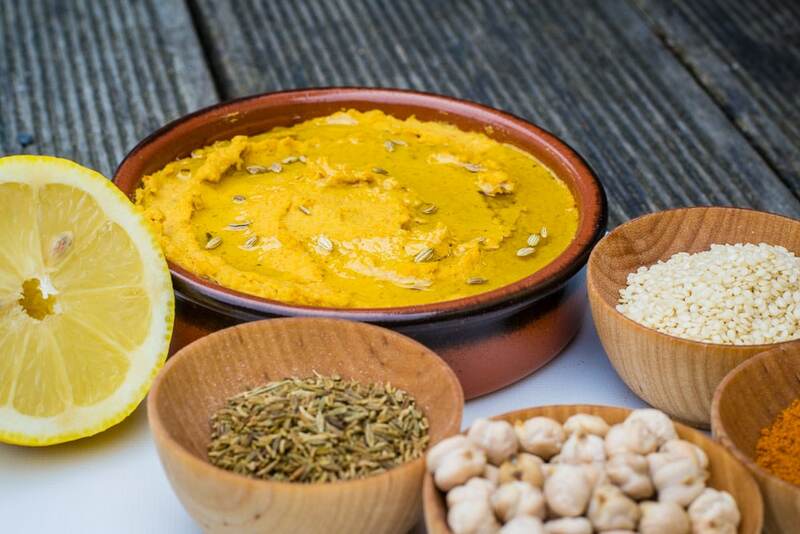 If you would like to omit the curry you will have the classic hummus recipe, whose only spice is the cumin. 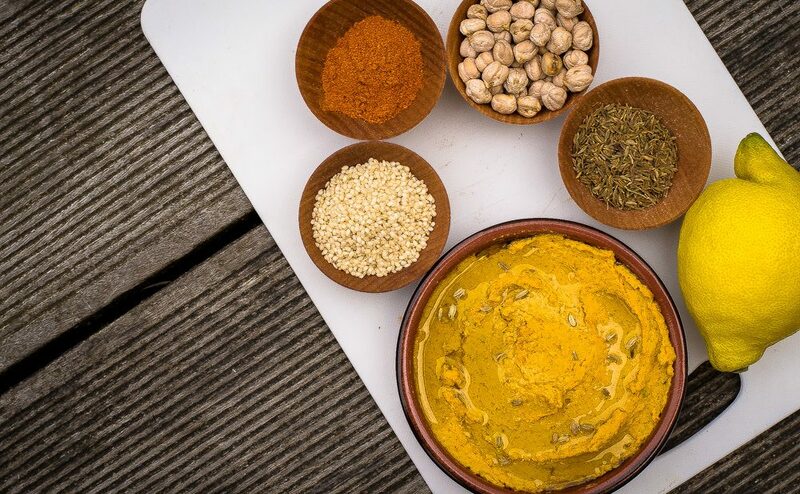 In my curry hummus recipe there are already cumin seeds because I like how they boost the hummus with flavor when you bite them, but if you want to go for the classic version I suggest you add a teaspoon of grind cumin. When it comes to making the actual hummus the only fat I use is the Tahini. I use extra-virgin olive oil on top only, when it is time to serve it. I must admit that when I first started preparing homemade hummus (roughly 8 years ago), I was using extra-virgin olive oil in the making. That’s just because it was listed on the list of ingredients on the box of the first hummus I had bought in Ireland! After experimenting different recipes for years, last year I eventually decided to stick to this recipe, in which the oil is added to the top only, once you have mixed all the other ingredients and the curry hummus is ready to serve. I was very pleased when I recently found out that the original middle east recipe does not require oil in the hummus, but on top only! Hummus is not only a dip but also a great spread that I like to add in sandwiches (often for the kids’ lunch box) or pittas. It lasts up to 4 days in the fridge. Put all the ingredients in the food processor. Serve with a dash of extra virgin olive oil on top.